FLUORIDE ACTION NETWORK (FAN): The integrity and generosity of the FAN team, and the quality of their work, is without parallel. Visit the FAN website for the most comprehensive fluoridation archive available, including updates on government agency actions that might impact the public’s exposure to fluoride, Clean Water news worldwide, fluoridation history, videos, and an expanding database of scientific reviews, reports, and studies on water fluoridation, offering evidence both for and against. OUR DAILY DOSE: Visit the beautiful website of Our Daily Dose Film for many reasons, not least, to read the Director’s Statement of award winning filmmaker Jeremy Seifert. SAFE WATER HEALDSBURG: Visit the Safe Water Healdsburg website to learn more about water fluoridation, and the latest from Healdsburg. 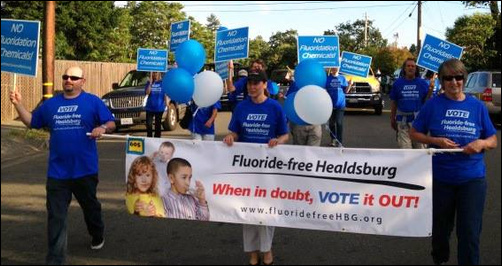 SONOMA COUNTY: NO FLUORIDE: Visit Sonoma County: No Fluoride on Facebook for up-to-date water fluoridation news. FLUORIDE-FREE SONOMA COUNTY: Visit Fluoride-Free Sonoma County for straightforward information on fluoridation issues. CLEAN WATER OREGON: Visit Clean Water Oregon, the newly renamed Clean Water Portland, the group that stopped water fluoridation in Portland, Oregon in 2013, and now works for fluoride-free water for all Oregon. THE THE GIRL AGAINST FLUORIDE: Visit The Girl Against Fluoride, the website of Nutritionist Aisling FitzGibbon and her inspirational movement to stop mandatory water fluoridation in the Republic of Ireland. Sign up for news and action alerts.